In today's collecting terms, the baseball cards from 1980s and newer are fairly inexpensive to buy. Topps, Fleer, and Donruss dominated the 1980s sales of baseball cards, while in 1989 saw the birth of the Upper Deck Company. Upper Deck dominated the hobby's attention with beautiful cards and innovative products. Competition intensified between all these sets up until the mid nineties. The result was hundreds of different sets and a confused collecting community, who was not quite sure what to collect. 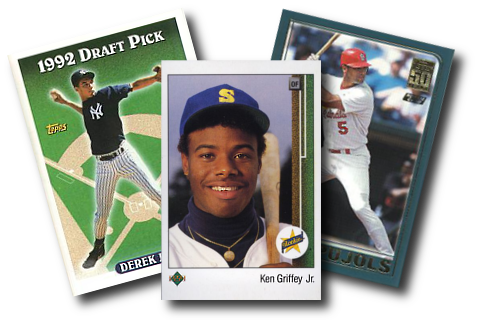 By the 2000s the baseball card companies refined their offerings and cards became much more consistent in quality. Competition for profits grew fierce among the remaining companies that survived the 90's. Today, baseball card collecting is "back to the future", as Topps is once again the sole manufacturer of baseball cards for Major League Baseball.